Restricted originally to plants of purely perennial habit—in the main, those whose growth begins afresh from ground level each year—the terms of reference have gradually been extended so that today we find included not only spring and summer bulbs and corms but also small shrubby plants and those curious in-betweens whose woody top growth persists throughout the winter, but which otherwise display most of the characteristics of true perennials. These are the sub-shrubs, of which plants such as the plumbago-flowered Ceratostigma willmottianum, Caryopteris clandonensis, and the Russian sage, Perovskia atriplicifolia are typical examples. Preparing the site Preliminary preparation of the site for an herbaceous border is of paramount importance. Much of its subsequent success or failure will depend on the thoroughness with which it is carried out. Some soils, of course are a good deal more difficult to prepare than others but whether you garden on heavy, back-breaking clay or easily managed well-drained sandy loam there must be sufficient supplies of humus in the soil if the plants are to give of their best. Deep digging and thorough cultivation are two further essentials. Most of the occupants of the border will remain in the same positions for at least three years, while other more permanent specimens such as paeonies, helebores, romneyas and hemerocallis can stay put almost indefinitely, without the necessity for division or replanting. Spent hops are another first-rate humus forming material. If you can obtain supplies in bulk from a local brewery, they will be relatively cheap. The so-called hop manures with added organic fertilizers are a convenient but expensive method of supplying humus to the border. Fortunately, the vast majority of the more widely-grown herbaceous perennials are very accommodating. They will thrive in most types of soil although characteristics such as height, vigor and rate of increase will vary considerably between, for example, light, sandy loams and heavy, sticky clays. It is a good rule never to coddle temperamental plants. There is neither time nor room for them in the herbaceous border, where plants are grown more for their effect in the mass than as individuals. Weeds The best time of the year to prepare the site for planting is late summer or early autumn. This will give the winter frosts a chance to break up heavy clods to a fine planting tilth. This, of course, is not so important with light sandy soils which can be cultivated at almost any season of the year. As digging progresses, it is imperative to remove every possible vestige of perennial weeds; the aim should be to start with a site that is completely weed-free, although when fresh ground is being taken over this can be no more than a counsel of perfection. to those of its shrub namesake and quite attractive flowers. It is easily identified by the pungent aroma of its bruised leaves and stems. Bindweed, also known as bellbind in some parts of the country, has attractive white trumpet-shaped flowers and a twining habit that can strangle any plant that is the object of its attentions. If annual weeds multiply alarmingly, and they will, in very wet summers, there is no need for undue despondency. Regular sessions with a hand fork or a lady’s border fork will keep them in check. Vigorous low-growing perennials will act as their own ground cover. In autumn, and in early spring if possible, the border should have a thorough forking over, removing and burning all perennial weeds. Any clumps of plants that show signs of weed infestation should be dug up. After shaking or washing their roots free of soil, offending weed roots or runners that have penetrated the plants should be carefully teased out and removed. The clumps can then be replanted in situ, or if their size warrants it, be split up and re-grouped. If the replanting is carried out without delay the plants will not suffer any check. In fact, very vigorous growers such as Michaelmas daisies, Campanula lactiflora and Chrysanthemum maximum will benefit from this procedure. Supplementary dressings Unless farmyard manure has been available in generous quantities it will be advisable to give a booster of some kind of fertilizer a few weeks before the border is planted up. Bonemeal and fish manure, which are both organic and slow acting, will give good results, applied at a rate of 60-80g (2-3oz) to the sq m (sq yd). As an alternative, a good general fertilizer, such as `Growmore’ can be used at the rate recommended by the makers. Siting Most of the more widely-grown perennials are sun-lovers, so that a position facing south or west will be the most suitable for the border. But since this feature is seen at its best when viewed lengthwise, it may be necessary, if we plan to enjoy its beauty from some fixed vantage point such as a terrace or the living room windows, to effect some sort of compromise where aspect is concerned. Generally speaking, any position except a sunless north-facing one, or one where the plants suffer shade and drip from overhanging trees, will be quite satisfactory. Background Just as a fine picture deserves an appropriate frame, so the herbaceous border needs a proper setting for its beauty. In the past this has usually been supplied by a background wall or hedge, but nowadays double sided and island borders are becoming popular, where the only background is provided by the adjacent grass or paving. Nothing, however, makes a more suitable backcloth than a well-kept evergreen hedge—yew, holly, cypress, beech, or hornbeam. Mellowed brick or stone wall, too, can act as a pleasing accompaniment, and even wattle hurdles or a wooden fence, when discreetly covered by climbing plants, can provide an attractive setting. Hedges, beautiful though they may be as backgrounds, also have their disadvantages. Most, if not all, hedging plants are notorious soil robbers. Some, such as privet, are much worse than others and should be avoided if a new planting is to be made. The roots of an established hedge can be kept in check by taking out a trench a foot or so away from the base of the plants and chopping back all the fibrous roots with a sharp spade. This operation, which should be carried out while the hedge is dormant, could very well coincide with the periodic overhaul and replanting of the border. If space permits, it is a good plan to leave a gap of 60-90cm (2-3ft) between the foot of the hedge and the rear rank border plants. This, incidentally, will also provide useful access to the back of the border for maintenance work. Yew, of course, is the best plant for a background hedge. Slow and compact in growth, it requires a minimum of attention—one ‘short back and sides’ trim annually will suffice, and its foliage of sombre green is the perfect foil for the bright colors of the border plants. As a general rule, in a border of mixed colors the paler shades should be at each end, with the brighter, more vivid ones grouped mainly at the center. For example, the pure whites of Phlox paniculata alba, Achillea ptarmica ‘The Pearl’, and Gypsophila ‘Bristol Fairy’ could melt almost imperceptibly into the cool primrose yellows of Achillea taygetea and Verbascum bombyciferum (syn. broussa), flanked by the deeper yellows of Hemerocallis ‘Hyperion’, one of the best of the free-flowering day lilies, and Lysimachia punctata, the yellow loosestrife. white once more through the blues of delphiniums, sea holly, (Eryngium maritimum) whose leaves, as well as the flowers are metallic blue, and the stately Echinops ritro, with thistle-like dark green foliage and drumstick flower heads of steely blue. Other suitable blue perennials include the attractive indigo-blue monkshood, Aconitum ‘Bressingham Spire’ and the curious balloon flower, Platycodon grandiflorum. These could be followed by the soft pinks of Geranium endressii, Sidalcea `Sussex Beauty’, the long flowering Veronica spicata—Pavane’ and ‘Minuet’ are both good varieties—and the later-blooming ice plant, Sedum spectabile `Brilliant’. And so back to white again, this time represented by Japanese anemones, Anemone hupehensis `Honorine Jobert’, Lysimachia clethroides, Potentilla alba and a good garden form of the sweetly scented meadow sweet, Filipendula ulmaria plena. 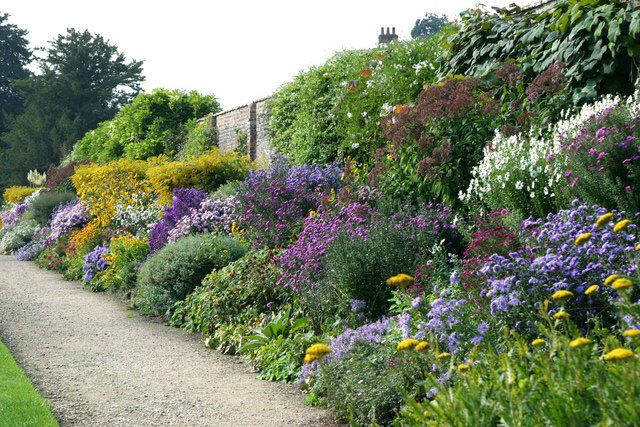 This, of course, would not constitute a complete planting plan, but is merely a suggestion that could form the framework of an attractive herbaceous border. color, though it may take pride of place in the overall display, is not everything where the successful herbaceous border is concerned. The form and leaf texture of the plants, as well as the manner in which they are grouped, all play a part that is vitally important to the ultimate effect. Although the general trend should be towards ‘shortest in the front, tallest in the rear’, this is a rule that should not be too rigidly adhered to. Some of the taller plants should be allowed to wander to the middle or even, at certain points, to the front of the border while the lower marginal plants can be permitted to flow unobtrusively inwards to make small pools and rivulets of contrasting height and color among their taller neighbors. A number of perennials are grown as much for the beauty of their foliage as for the decorative quality of their flowers. Outstanding among these are the hostas, or plantain lilies with their outsize ribbed leaves, acanthus, whose sculptured foliage formed the classic model for the Corinthian capitals of Ancient Greek architecture, hemerocallis, Iris sibirica and kniphofias for the contrasting effect of their sword-like leaves, the variety of rue known as Rata graveolens ‘Jackman’s Blue’ and others whose names have been indicated in the list below. Other plants are cultivated for their attractive seed heads. These include the fascinating but invasive Chinese lanterns (physalis), the silvery tasselled Pulsatilla vulgaris or Pasque flower, Baptista australis with its soot-black seed pods and the magnificent Heracleum mantegazzianum, a garden plant resembling a giant cow parsley whose outsize flat seed heads are borne on stems 3m (10ft) or more tall. Planting holes should be of sufficient depth and breadth to accommodate the roots of the plants without bunching or overcrowding. Small plants can be firmed in by hand, but for large clumps the heel of the boot will be required. Although firm planting is desirable, this should not entail embedding the roots in a pocket of sticky ‘goo’. In heavy clay soils, planting will have to be delayed until the soil condition improves or, better still, the holes can be filled with sifted compost or a mixture of dry soil and peat that has been kept under cover for this purpose. With the more vigorous perennials such as golden rod, shasta daisies, achilleas and campanulas, it is not necessary, if time presses, to be too fussy over planting procedure, provided that the soil has been properly prepared and is in good heart. Others, however, such as paeonies, alstroemerias and hellebores will need more careful attention. Paeonies, for example, should never be planted with their dormant growth buds more than approximately 5cm (2in) below the surface; planting too deeply is one of the commonest causes of failure to bloom satisfactorily. The planting or division of catmint is better delayed until spring. Autumn-planted specimens frequently fail to survive. This is a rule that might well be applied to all grey-leaved border plants. Once established they can tolerate severe weather conditions but in their first winter they often succumb to severe frosts if they are planted in autumn. For the newcomer to gardening, the importance of dealing only with reputable nurseries cannot be overstressed. Their catalogues, in addition to lists and descriptions of plants, will often contain a wealth of information regarding their likes and dislikes. Plants, too, will be delivered at the most appropriate time of year for planting out. Choice of plants Anyone starting an herbaceous border from scratch would be well advised to take advantage of the many new plants and modern varieties of older favorites that require little or no staking and tying. By this means, one of the major summer chores in the border can be considerably reduced. Plants such as tall delphiniums will, of course, have to have each individual flower secured to a stake or stout cane. If space permits, it is better to segregate these and other similar top-heavy plants ; they do better where they are more easy to get at for maintenance. Not all the taller border plants suffer from this shortcoming; Artemisia lactiflora, for example, is a plant whose 2m (6ft) stems of feathery milk-white flowers, smelling like meadowsweet, will stand up to a howling gale without turning a hair, while others, for example the moon daisies and taller perennial asters, will collapse and sprawl at the first hint of rough weather, if they are not securely staked. Double-sided or ‘island’ borders achieve similar results in a different way. Plants grown in an open situation are sturdier and more compact than those grown against a wall or hedge which tends to cause them to be drawn both upwards and outwards. This sturdier habit makes them less liable to damage by heavy winds and rough weather, and, in addition, access at both sides of the border makes routine maintenance a good deal easier. The idea of a double-sided border is not new. Formerly, in large gardens, they were commonly used as a decorative edging in the kitchen garden where they served the dual purpose of screening the vegetable crops and providing flowers for cutting. 1-1.3m (3-4ft) in order that the kaleidoscopic color effects of the plant groupings can be seen to their best advantage. short period during which it makes a major contribution to the garden display. Reaching its peak in July and August it continues to delight in early autumn and retires in a blaze of Michaelmas daisies, red hot pokers, perennial sunflowers and border chrysanthemums, which carry it through, in most districts, until mid October. Spring bulbs, such as daffodils, tulips, hyacinths, chionodoxas, scillas and grape hyacinths, all make first-class curtain raisers and will fill the spaces between perennials with bright spring color. A little later wallflowers, polyanthus, forget-me-nots and other spring bedding plants can be used as gap-fillers. 3 promise of its name, unless it has the protection of cloches or a cold greenhouse, but it can be relied on to open its pure white chalices by the middle or end of January, although even then it will still appreciate a little protection to save its immaculate petals from damage by wind and rain. Following close on its heels comes the Lenten rose, Helleborus orientalis and other delightful species that include the stately H. argutifolius (syn. H. corsicus) and our native H. foetidus, whose green flower clusters are a good deal smaller than those of the Corsican species. In February and March, too, there will be the pink and carmine flower trusses of the bergenias, among the finest of flowering perennials. These useful plants, that used to be called megaseas, are outsize members of the saxifrage family and most species are evergreen so that their handsome fleshy leaves, bronze or reddish in winter, as well as their striking flowers, make a valuable contribution to the winter border. `Ballawley Hybrid’, a relatively new introduction from Ireland, is one of the most outstanding examples of the group. Other good forms and species include B. cordifolia with rounded crinkly leaves, B. crassifolia, probably the most commonly-seen, whose leaves are more spoon-shaped than round and B. schmidtii, an unusual species the leaves of which have hairy margins and whose loose sprays of clear pink flowers are the earliest to appear. There are several species of pulmonaria, the most striking of which is P. angustifolia azurea, with clear gentian-blue flowers. It looks superb in conjunction with the yellow daisy flowers of the leopard’s bane, Doronicum `Harpur Crewe’. P. angustifolia rubra has coral-red blossoms, those of P. saccharata are pinkish-purple turning to blue; the multi-colored appearance is responsible for its nickname of soldiers and sailors, while its strikingly-mottled leaves have earned it the popular title of spotted dog. Incidentally, the foliage of all the lungworts, which remains tidy throughout the summer, acts as an excellent weed-cover. In the shadier parts of the border Hepatica triloba with its leathery, ivy-like leaves and true-blue flowers, together with primulas and polyanthus will all make pools of color in April and May. The golden flowers of Alyssum saxatile flore pleno will shine even more brightly in association with the white flowers of the perennial candytuft Iberis sempervirens ‘Snowflake’, in the sunny spots at the edge of the border. To provide color continuity from late summer onwards there are, in addition to the indispensable Michaelmas daisies, various other perennial and bulbous plants. The grey-leaved Anaphalis triplinervis is one of these. Its papery ‘everlasting’ white star-like flowers, which appear first in July, will still be immaculate in October. The Japanese anemone, Anemone hupehensis, of which there are now many lovely named varieties, will start to throw up clusters of chalice-like blossoms from early August until the first heavy frosts arrive. The single forms, both pink and white are still firm favorites, but if you are looking for something out-of-the-ordinary you might like to try `Margarete’, a double pink, with rows of ruff-like petals. ‘Prince Henry’, sometimes listed as ‘Profusion’, is one of the most striking singles, its color much richer than those of the other pinks. In sheltered bays in the border from August onwards, two closely-allied South African bulbous plants will make a welcome splash of color. The blue African lily, agapanthus—the species A. campanulatus is perfectly hardy in the south of England—has drumstick heads of powder-blue flowers, while those of Nerine bowdenii are similar, but less tightly packed with pink florets. `Fenwick’s Variety’, an attractive pink, is the best form for out-of-doors. Winter work Apart from the periodic division, replanting and occasional replanning of the border, winter maintenance will consist mainly of tidying-up and light forking between the plants. There are two schools of thought where the former operation is concerned. Some gardeners prefer to leave the tidying of the border until spring—the dead leaves and stems, they claim, protect the crowns of the plants in really severe weather. Others, who cannot stand the sight of so much dead untidy vegetation cut down the dead stems at the earliest opportunity. There is a lot to be said for the former point of view, but a lot will depend on how the border is sited. If it is in full view of the house windows, the sooner it is made ship-shape the better. Only a very small number of popular herbaceous perennials are delicate enough to suffer irreparable damage, even in the severest winter. Plants, such as eremurus and Lobelia fulgens, which may be damaged by frosts, can be protected by covering their crowns with weathered ashes or bracken. Where the border is more remotely situated, clearing up operations can take their place in the queue of urgent garden tasks that make their heaviest demands on us during the winter months. Other uses of herbaceous plants Perennials have become so closely associated in our minds with the herbaceous border that we tend to overlook their many other uses in the garden. For example, bedding schemes employing perennials can be just as attractive as those in which the more orthodox hardy and half-hardy annuals are used. What is more important, management and upkeep will be simplified and costs will be less where these versatile plants are utilized. Perennials as bedding plants For bedding purposes, it will be necessary to choose perennials with a relatively long flowering season and/or attractive foliage, plus a solid and compact habit of growth. Among those fulfilling such requirements are Brunnera macrophylla (syn. Anchusa myosotidiflora), the so-called giant forget-me-not, Anemone hupehensis, the Japanese anemone, Armeria maritima, thrift, the medium and dwarf Michaelmas daisies and dwarf delphiniums, for example D. ruysii or D. chinensis. The two last-named, in common with a number of other perennials, have the added advantage of being easy to grow from seed. This works well for herbaceous plants such as lupins, flag irises, paeonies, oriental poppies and the taller delphiniums. A further point in favor of this method is that it avoids the bare patches that tend to appear in the border when such early-flowering perennials form part of the general scheme. Other herbaceous perennials that will benefit from this method of culture are the Michaelmas daisies. Where sufficient space is available, a representative collection, grown in a bed or border devoted to them alone, will make a far greater impact than they would dotted about in groups in the mixed border. Waterside planting Although the great majority of perennials will thrive in a wide range of garden soils and situations, there are some that prefer shade and moisture, conditions that cannot always be easily provided in the herbaceous border. These make excellent plants for the waterside—by the banks of streams or artificial watercourses or at the edge of the garden pool. Primulas, astilbes, Iris sibirica and Iris kaempferi, kingcups (Caltha palustris) and the globe flower (Trollius species) are just a few that will grow better in damp, shady positions. Cut flowers Satisfying the demands for flowers for the house in summer, when they fade so quickly, sometimes results in the display in the border being spoiled by too lavish cutting. A satisfactory way of avoiding this is to grow perennials specially for the purpose, either in rows in the kitchen garden, or bordering the vegetable plot. For this, it is only commonsense to choose those that will not only cut and last well, but will also need minimum attention where staking and tying are concerned. A representative, but not exhaustive list of these appears below. It should be obvious, from the foregoing, that the uses of perennials are many and varied.